Download eMagazines, eAudiobooks, eBooks, eVideos, and eMusic— all available with your valid Stratford Library card. Flipster – Popular magazines downloadable to your computer or mobile device. OneClick Digital – Download an audiobook for kids from Stratford’s collection or browse a state-wide collection of downloadable audiobooks. OverDrive – Download free ebooks and eaudiobooks to your electronic device. Hoopla – Instantly borrow free digital movies or tv episodes. Ebooks, downloadable audiobooks, and digital comics are also available. TumbleBookCloud Junior – ebooks and read-alongs for kids in grades three to six. 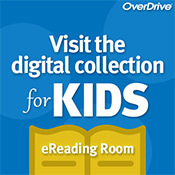 OverDrive for kids– Download free ebooks and eaudiobooks for kids to your electronic device. 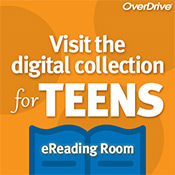 OverDrive for teens– Download free ebooks and eaudiobooks for teens to your electronic device. Freegal – Stream music and create playlists. You can also download up to 5 songs a week with your library card. The songs are yours to keep. Look for the Freegal app in the Apple App Store and Google Play.